Note: It is recommended to play this on a desktop with sound turned on. I haven't done any testing on mobile. This game and all assets were made in a weekend for Jamingtons 6.0. This project explores the use of various media to support interactive fiction. The loops for the video and audio are crude and not seamless - but work for demonstrating the concept. The project was made using Vue.js, which is commonly used as a reactive user interface framework. Inspiration was drawn from the Twine engine. A primary goal of this project was to create a Vue.js boilerplate project that replicated the functionality in the Twine engine. Jam disclaimer: I didn't start this project from scratch. I began with a boiler plate I made a week prior (see git log). but i really like the game, especially the art,i like the "feel" of the game! 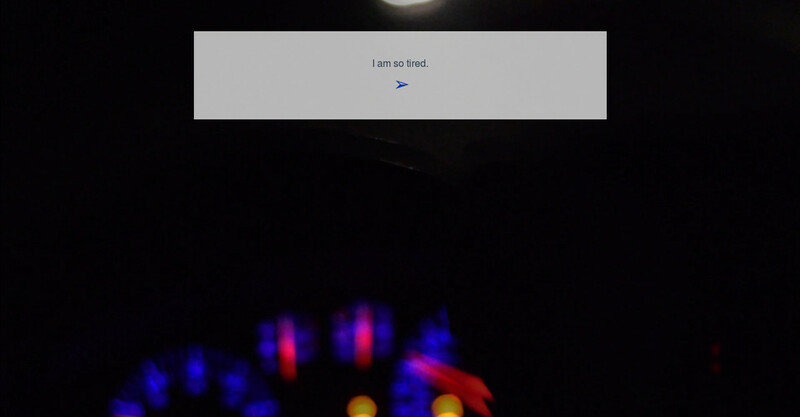 I did put a lot of focus on trying to capture how to feels to be drowsy while driving at night. The video and audio were hastily captured over the weekend, but I think it works. Thanks again!